Marcel Lefebvre grew up in a deeply Catholic family where his priestly vocation blossomed naturally. The need to give himself to God and to souls leads him to enter the seminary and become a priest. 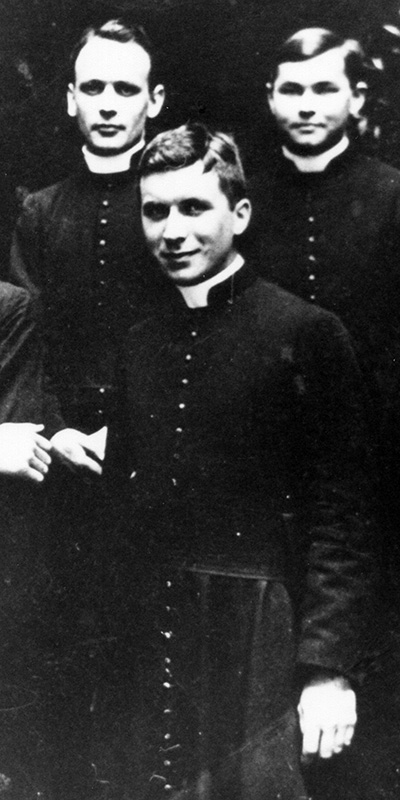 Marcel Lefebvre was born in Tourcoing on November 29, 1905, the third of eight children, five of whom consecrated themselves to God: Rene and Marcel as priests and missionaries, Jeanne as a Sister of Our Lady of Reparation, Bernadette as a Holy Ghost Sister, and Christiane as a Carmelite. The father of that large family was an industrialist from northern France who died in a Nazi labor camp in 1944. The mother of the family, also a descendant of factory owners in northern France, was a Third Order Franciscan and a Red Cross nurse; she was able to combine good works with the interior life, offering to God both her difficulties and her accomplishments. As an adolescent, Marcel too felt the need to give of himself. He rode through the streets of Tourcoing on his bicycle to visit the poor. He repainted the apartment of a paralyzed, impoverished clockmaker, found him some clients and thus transformed his life. An ardent desire to save souls burned in his heart. After mature reflection, he decided to become a priest. After entering the French Seminary in Rome (1923-1930), on the via Santa Chiara, he became the fervent disciple of Fr. Henri Le Floch who, in his spiritual conferences, revealed to his pupils the providential role of the popes over the course of Church history, in particular the constant battle of the most recent Roman Pontiffs against the errors of their century: Liberalism, Socialism, Modernism. But what captured his attention most was the inaugural encyclical of Pope Pius X, E supremi apostolatus (1903), as well as his motto, “To restore all things in Christ”, which Marcel made the program of his priestly life. Young Fr. Lefebvre was on fire for the social and political reign of Christ the King, as it is promoted by Pope Pius XI in his encyclical Quas primas (1925). At the Gregorian University, he soon earned doctoral degrees in philosophy and theology, which testify to his in-depth knowledge of all matters pertaining to the science of God and of souls. After he was ordained a priest on September 21, 1929, in his home diocese, he was appointed curate in a working-class suburb near Lille (1930-1931). On the Feast of Corpus Christi he convinced the pastor, Fr. Delahaye, to organize a public procession with the Blessed Sacrament through the streets of the town of Lomme, despite the threats of the Communists. Though happy to conduct his priestly ministry among simple souls, he nevertheless felt attracted to the religious life and the missionary apostolate. And so he entered the novitiate of the Holy Ghost Fathers in 1932. “God is charity.” Now the essence of charity, the essential feature of love is to give oneself. Therefore the Spiritan Marcel Lefebvre, like the adolescent of earlier years, would give himself to souls so as to draw them to Jesus Christ, to God. Marcel Lefebvre was born on November 29, 1095 in Tourcoing. On October 25, 1923 Marcel entered the French Seminary in Rome. 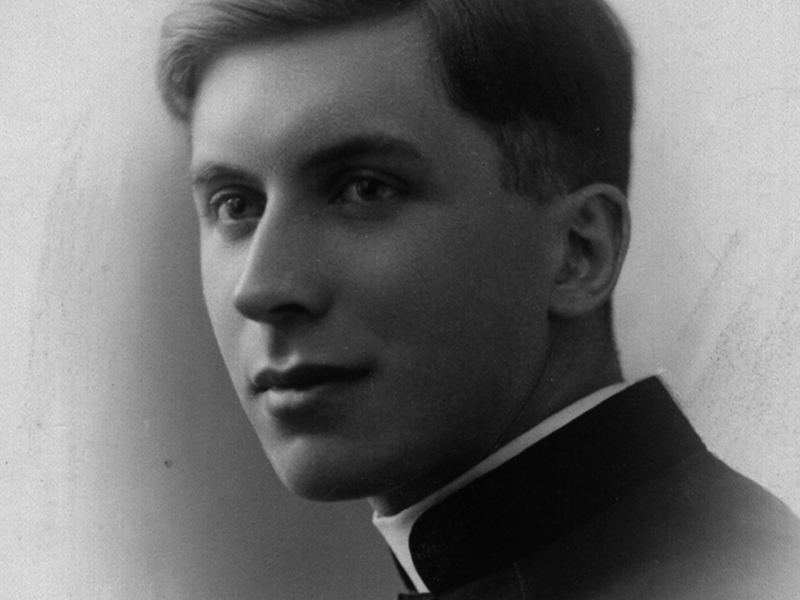 After six years of study he was ordained a priest on September 21, 1929. "We remained attached to all those beautiful papal encyclicals which showed us where the truth is, the sources of evil, the sources of errors, and what is bad in the world today".